Gregor Townsend insists his Glasgow side must improve on their display against Montpellier to progress in the European Champions Cup. Warriors beat the French outfit 21-10 at Scotstoun on Sunday but failed to secure a bonus point. They may now need a bonus-point win at Bath next week to qualify for the quarter-finals. "We'll know all of the permutations by the time we play and we'll have to play much better," Townsend said. "We've done the first job which was to get the four points and we're just disappointed we weren't able to get a fifth. "Maybe a win will be enough, we'll know by Sunday, but winning in Bath, who I think are second in the Premiership at the moment, is always going to be a very tough task." Head coach Townsend watched DTH van der Merwe score a hat-trick of tries to sink Montpellier, but he insists his charges did not find their best form. "We play to win games but we also play to play as close to your potential as possible, and we didn't play near close enough today," added Townsend. "We left a lot of opportunities out there. "The effort was great and the determination to try to get that fourth try was great to see, but there were too many errors. "When we got close to the try line a lot of people seemed to be queuing up wanting to take the ball rather than just work through our normal shape when we're in that area, but I have to say the players put in a huge effort. "Montpellier have an excellent line-out drive and an excellent scrum. I know they scored off a line-out drive, but they had a lot of other opportunities that we defended well. Our scrum looked excellent today." Hat-trick hero Van der Merwe remains hopeful that Glasgow can progress from Pool 4 when they head to Bath, on Sunday. "I'm happy with the tries and it was an outstanding team performance," he told BBC Scotland. "We're a little disappointed we didn't get the four tries but we're still in it and a win's a win against a great Top 14 team. "We've left ourselves a bit of work for next weekend but we're still in it. We need to get the five points [in Bath]." 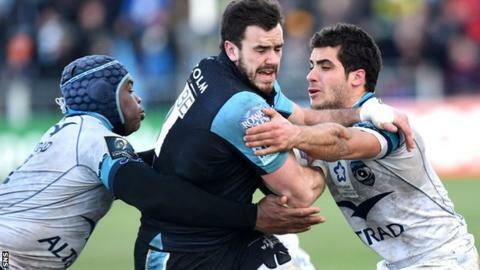 And centre Alex Dunbar was in no doubt about where Warriors fell short in the victory over Montpellier. "Delighted with the win but we had a lot of chances to get the bonus point - our execution let us down," he said. "It was our composure, because we created chances and just didn't quite finish them."